Hal David was the Chairman/CEO of the Songwriters Hall of Fame, and he was President of ASCAP from 1980-1986. 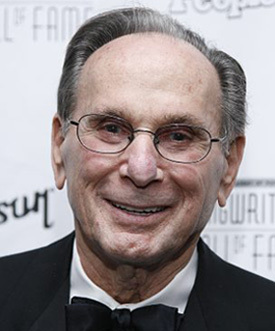 Note: Hal David passed away in 2012 at the age of 91. Here’s the special interview we did with Hal in 2010. 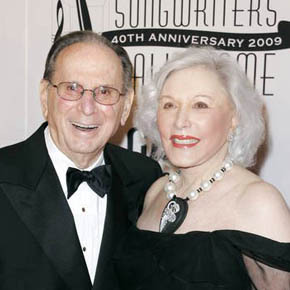 Hal David was one of pop music’s most acclaimed, hit songwriters for over five decades. He won multiple Oscar and Grammy awards, and he wrote over 40 Top 10 pop hits, many which reached #1 and are considered pop standards. Known for being an exceptional lyricist, David collaborated with main partner Burt Bacharach and other songwriters to create an enduring collection of hit pop songs and movie themes. At age 89, two years before his passing, David made a special appearance at the Grammy Museum in Los Angeles, to launch the Songwriter’s Hall Of Fame Gallery at the museum. At the time, he was Chairman/CEO of the Songwriters Hall of Fame and presided over the launch ceremony. He even sang some of his classic songs at a Hall of Fame concert which also featured performances by Paul Williams, Ashford & Simpson, Lamont Dozier and Mac Davis. David graciously granted an extensive interview to me, to talk about the Hall of Fame, and to recall his great career. It was an honor to do this interview. 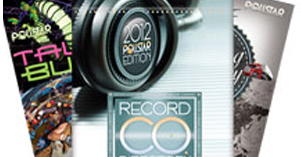 Before starting the Q&A interview, please find below a discography of the hits that David co-wrote. David & Bacharach wrote many hits for Dionne Warwick, including “Alfie,” “Walk On By,” “Anyone Who Had A Heart” (also a hit for Luther Vandross); “Don’t Make Me Over,” “Message To Michael,” “Trains And Boats And Planes,” “I Just Don’t Know What To Do With Myself,” “I Say A Little Prayer” (also a hit for Aretha Franklin); “(Theme From) Valley Of The Dolls,” “Promises, Promises,” “Do You Know The Way To San Jose,” “This Girl’s In Love With You,” “I’ll Never Fall In Love Again,” “Reach Out For Me.” and “You’ll Never Get To Heaven (If You Break My Heart)” (also a hit for the Stylistics). Other hits written by Bacharach & David include: “What The World Needs Now Is Love” (Jackie DeShannon); “Raindrops Keep Falling On My Head” (B.J. Thomas); “(They Long To Be) Close To You” (the Carpenters); “Baby It’s You” (the Shirelles); “Only Love Can Break A Heart,” “The Man Who Shot Liberty Valance,” “Twenty-Four Hours From Tulsa” and “True Love Never Runs Smooth” (Gene Pitney); “(There’s) Always Something There To Remind Me” (Sandie Shaw, Naked Eyes); “What’s New Pussycat” (Tom Jones); “The Look Of Love” and “Wishin’ And Hopin”’ (Dusty Springfield); “One Less Bell To Answer” (Fifth Dimension); “This Guy’s In Love With You” (Herb Alpert); “Magic Moments” (Perry Como); “Any Day Now” (Chuck Jackson); “Tower Of Strength” (Gene McDaniels); “Make It Easy On Yourself” (Jerry Butler and the Walker Brothers); “Blue On Blue” (Bobby Vinton); “Wives And Lovers” (Jack Jones); and “My Little Red Book” (Manfred Mann). 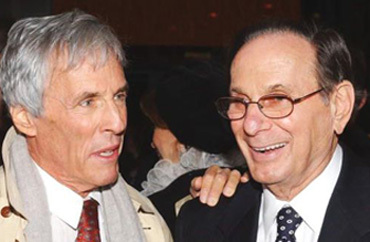 Burt Bacharach & Hal David. David also wrote hit songs with several other writers, including: “To All The Girls I’ve Loved Before” (Willie Nelson & Julio Iglesias) and “99 Miles From L.A.” (Albert Hammond), which were written with Albert Hammond; “It Was Almost Like A Song” (Ronnie Milsap), written with Archie Jordan; “The Four Winds & the Seven Seas” (Vic Damone), written with Don Rodney; “Broken Hearted Melody” (Sarah Vaughan), “Johnny Get Angry” (Joanie Sommers) and “Outside My Window” (the Fleetwoods), written with Sherman Edwards; “Sea Of Heartbreak” (Don Gibson), written with Paul Hampton; and “My Heart Is An Open Book” (Carl Dobkins, Jr.), written with Lee Pockriss. DK: Congratulations on the opening of the Songwriters Hall of Fame Gallery at the Grammy Museum. Have you been planning this Gallery for a long time? Hal David: It’s been in the works for awhile. Three years ago Bob Santelli (Executive Director of the Grammy Museum) asked me if I wanted the Hall of Fame to be presented at the Grammy Museum, which I thought was a great idea. We decided to work it out. DK: Will this Hall of Fame Gallery be permanent at the Grammy Museum? David: We’re very pleased with this new Gallery. This Gallery (at the Grammy Museum) is the beginning of our dream of having a museum for our Hall of Fame. We will eventually have galleries elsewhere. And some day we will have a brick and mortar building–a standing museum of our own. DK: Besides honoring great songwriters, what are the main purposes of the Hall of Fame? David: Our main purpose besides honoring songwriters, is to provide the education for people who really want to be involved in the music business–the songwriting, the music publishing and every aspect of the music business. DK: You’ve had such a great career as a songwriter. How did you get started? David: I grew up in Brooklyn (NY), I played the violin in high school, and I was in the orchestra. Later on I had a band, and we played a couple seasons in the Catskills–we played weddings and Bar Mitzvahs. I started to write songs–not just the lyrics but some music too. In addition, I worked as a copywriter for the New York Post. Then during World War II, I was in the Army and our unit was shipped overseas to Oahu (Hawaii). When we arrived, there was a longshoreman’s strike and we had to unload the ship ourselves, which was back-breaking work. I passed by the orderly’s tent and noticed that the USO was holding auditions for its Army show. I was hoping to get involved with the USO, so I went to the USO building in Honolulu, and I was inteviewed by Major Maurice Evans, who was a famous actor. Maurice was in charge of the Army Entertainment Section in the Central Pacific. I embellished my credits as a writer & musician, and he told me, “Why don’t you stay here?. We’ll get you on a detached service (away from my regular unit) and we’ll see how it goes.” Then they took me on a truck to Farrington Hall at the University of Hawaii. I met director George Schaefer, who was producing a variety show. I became a writer for their shows, and I wrote a song called “Shape Ahoy” which the girls loved, and which became the title of the show. There were some terrific performers who were part of this Entertainment Section (who later became stars) such as Carl Reiner, Allen Ludden and Werner Klemperer. After 2 1/2 years, I was released from the Army and went back to Brooklyn. I knew being a songwriter was what I wanted to do, instead of writing copy for a newspaper or for an ad agency. I wanted to write songs, so I came to the Brill Building (around 1946). I started getting songs published. I had my first hit in 1949 with “The Four Winds & the Seven Seas.” We had 20 artists who recorded this song, including Guy Lombardo and Bing Crosby. I wrote it with Don Rodney, who was a guitarist and a vocalist with the Guy Lombardo Band. Little by little, I met so many people and I wrote with Sherman Edwards, Leon Carr, Lee Pockriss, Paul Hampton and other writers. I started writing hits such as “Bell Bottom Blues” for Teresa Brewer, “American Beauty Rose” for Frank Sinatra, and “Broken Hearted Melody” for Sarah Vaughan. This was in the late ’40s and early ’50s, before I worked with Burt (Bacharach). DK: How did you and Burt Bacharach first meet and start writing together? David: I was working at Famous Music and Burt was also working at Famous. One day we decided to try writing some songs together, and things worked out very quickly for us. From the first five songs we wrote, two of them became hits. We had a hit, “The Story Of My Life,” with Marty Robbins. It was in 1957 that we started writing together, and we began having hits in 1958. We had the hit “Magic Moments” which was recorded by Perry Como. During this period I was still writing with other people. It wasn’t until 1962 that Burt and I wrote only together, which was around the time we met Dionne Warwick. DK: How did you meet Dionne Warwick? 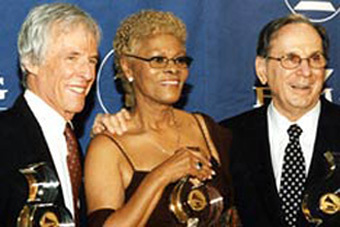 Burt Bacharach, Dionne Warwick & Hal David. David: [Burt and I] started getting hot and we got a lot of records. Then one day, a young girl named Dionne Warwick sang on one of our sessions. We were blown away with how good she was. We then hired her to sing demos for us. We realized she was an extraordinary singer. We took her demo to Florence Greenberg (President of Scepter Records), and we signed a contract to produce Dionne. The first record we did was “Don’t Make Me Over,” which became a big hit. Then we had hit after hit after hit for 17 years. DK: How did you and Burt write together? Did you write the lyrics first, or did he create the music first? David: Sometimes Burt wrote the music first–for example, ‘Do You Know the Way to San Jose.” Sometimes I wrote the lyrics first–for example, ‘What the World Needs Now is Love.” And sometimes we sat in the same room at the Brill Building, and we’d write the song together. DK: You and Burt had a lot of success writing songs for movies. How did this happen? David: At first it wasn’t easy. We wrote “Wives and Lovers” for the movie (starring Janet Leigh and Van Johnson), but it wasn’t in the movie because Burt was still under contract to another studio. We wrote the song “The Man Who Shot Liberty Valance,” and the film people wanted the song in the picture, but director John Ford was opposed to the song being in the movie. Then we wrote some songs for Paramount movies. We didn’t get our great movie break until we were in New York at the Savoy Ballroom, where Dionne Warwick was performing. We ran into film producer Charlie Feldman (known as Charles K. Feldman) and his girlfriend at the time, Clotille, who later became his wife. Clotille knew our songs and she recommended us to Charlie. She said, “These are the guys who should be writing songs for your pictures.” This led to us writing the songs for What’s New Pussycat (with the hit theme song sung by Tom Jones), and Casino Royale (which had “The Look Of Love” sung by Dusty Springfield). Then other people started calling us to do movies. We were quite hot (in both music and movies), and life was beautiful. We also wrote the songs (for the hit musical) Promises Promises, which is now being revived on Broadway. DK: I love your classic song “Raindrops Keep Falling On My Head.” How did you write this song? David: We wrote “Raindrops” for the movie Butch Cassidy & The Sundance Kid. B.J. Thomas, who was an artist on Scepter Records, recorded this song. B.J. wasn’t a big star yet, but we knew the song was just right for him, and it turned out terrific. DK: After many years of hit success, you and Burt seemed to end your prolific partnership in the ’70s. What happened? David: Things went well until the mid-’70s, when things started to slow down a bit. Burt was involved in becoming an artist himself, so he was performing live and touring more. There was a certain point when we were estranged. We didn’t talk very much for a while. But that period ended and we eventually got back in touch, and we did work together on some new projects. We would still write together, usually for a motion picture or writing pop songs. DK: Following your partnership with Burt, you continued to have hit success with other collaborators. I love your song, “To All The Girls I’ve Loved Before” (a Willie Nelson & Julio Iglesias duet hit in 1984). How did this song happen? David: I wrote this song with Albert Hammond. Years earlier, I was introduced to Albert by execs at Columbia Records, who wanted me to collaborate with him. They said, “We’d like you to write an album together with him.” We wrote “To All The Girls We’ve Loved Before,” and the song “99 Miles From L.A.,” which became a hit for Albert. Then (in 1984) it was either (producer) Richard Perry or Willie Nelson who came up with the idea of Willie and Julio singing this song as a duet. 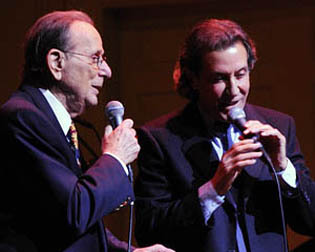 Willie loved to do duets, and he loved doing this duet with Julio. DK: You’ve written so many great songs over the years. Do you have any personal favorites? David: I’ve always loved “Alfie,” “Raindrops Keep Falling On My Head,” “What The World Needs Now Is Love,” and “The Look Of Love.” But it’s hard to pick favorites because the songs are like my children. DK: Are you still writing songs today? David: I still write new songs. Last June I collaborated with John Cacavas to write an album of new songs for a company in London. They used three or four different singers for this album project. DK: You’ve been a songwriter, and you’ve helped songwriters, during your whole career. In these current times, what advice would you give to young songwriters who are trying to break into the music business? David: It’s a very different business now. It’s not quite as lucrative as it used to be (even if you’re successful). And the one thing that will always happen, is that many people will try to discourage you. They’ll say that the music business is too difficult, or that you don’t have the talent. They can offer many negatives. And if that discourages you then you shouldn’t be in the business. You have to believe in yourself all the way. You’ve got to throw off the discouragement and move forward. Chances are if you stay with it, you’ll succeed.